Though his reputation rests primarily on two films, Diabolique and The Wages of Fear, director Henri-Georges Clouzot established himself as a consummate professional throughout his career, dabbling in a variety of genres with a consistently skewed, often cynical world view. 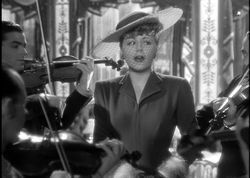 An exceedingly peculiar entry in the film noir cycle which exploded after World War II, Quai des Orfèvres mixes double crosses, sumptuous photography, scheming dames, and musical numbers with energetic glee. Under the stage name of Jenny Lamour, dance hall performer Margueritte (Rocco and His Brothers' Suzy Delair) constantly stokes the passions of her often jealous husband, Maurice (Bernard Blier, father of director Bertrand). The lecherous patrons of the club display more than a passing interest in the full-figured chanteuse as well, particularly one pawing old man whose elegant jackets disguise a wolf underneath. When Maurice bursts into the old man's home to find a corpse by the fireplace, Inspector Antoine (Louis Jouvet) must get to the bottom of the mystery. Police interrogations and attempted lesbian trysts ensue. Clouzot's comeback film after his scandalous, politically incendiary Le Corbeau (The Crow), this frenetic mixture of styles and genres is unmistakably the work of a younger, slightly less precise talent than the man who later created indelible art from jungle-traversing truckers and homicidal schoolteachers. 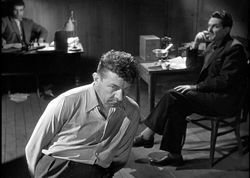 It's also one of the most superficially pleasant noir films, with characters who are just as likely to end up happily as dead. With the threat of prison hanging over the entire second half of the film, Clouzot ratchets up the suspense level but still finds time for entertaining ways to appease the crowd, be it a funny throwaway line or an audacious camera move, including some delectable crane shots guaranteed to give film students chills. While Delair (Clouzot's mistress at the time, so the story goes) isn't exactly Marlene Dietrich, she carries her role well enough and keep viewer sympathies in her camp (even when she's seemingly taunting the poor saps around her); however, it's Blier who really steals the show with his sad-sack but sympathetic spouse who might wind up with a murder rap. As with Criterion's other titles released in conjuction with Rialto, this is a stunning transfer all around with nary a blemish in sight. Detail level is exquisite, particularly in night scenes which find characters framed in both the foreground and background as reflective lighting and billowing cigarette smoke play across their faces. The comparatively blurry theatrical trailer gives a clear idea of how this must have looked pre-restoration, and the end result is thoroughly satisfying. The optional English subtitles are literate and well-paced, nicely capturing the wildly different speech idioms of the characters from different class levels. Extras include a video interview with Clouzot about the film, the aforementioned trailer, and a still gallery including some wonderfully atmospheric poster art.